Where are project portfolio decisions made in your organization? Where are priorities set up — say, based on strategic goals and key development areas? 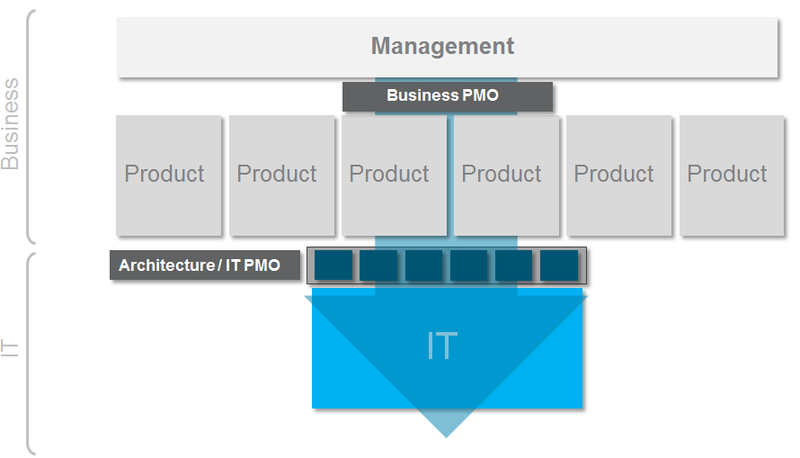 Finally, where is the PMO located in the org’s structure? Some organizations do not face many portfolio-related decisions (of the “what do we do with our strategy” type). These might have never reached a high level of push on projects — due to a lack of funds, complex structure with competing goals, and/or decision bodies. Oftentimes, they do not have a PMO at all. If anything — there’s one scattered on the IT side, dealing with both Business and IT projects. At some moment in time, infrastructure projects may be separated from the rest. That’s it. There’s hardly any development inhouse — most of it done by external suppliers. Neither the Business nor IT know much about what the other does in “that other black box”. There are organizations where there’s so much money that IT becomes a bottleneck. It’s costly, incomprehensible, always asks for more time, and… “why can’t these guys dress up in the first place?” Portfolio decisions are then made on IT level — what goes, what stays, obviously with management involvement, but with a very important stake in IT altogether. I’ve come across organizations where there was hardly a need for individual steering committees for that reason. What for?! We need to process financial decisions in a FIFO manner on portfolio level. Not if but who gets the money. Weekly, no! biweekly if needed. At some moment the Business understands that there is more to say from a strategic perspective and a Business-level PMO might come into play. Then, there are organizations which managed to build a management-level PMO deciding about corporate standards, aligning reporting up to top management, not to mention — facilitating portfolio decisions, based on key factors for the organization, e.g. strategic goals, products, channels, markets, client groups, you name it. There might even be a balanced scorecard somewhere, KPIs and KSIs aggregated from team to board level. The relations between Business and IT might be based on budgets and resources (budgets again) — to see what’s available for the business portfolio managers to share for their initatives (in accordance with strategic priorities). Obviously, this has to mature — mapping the processes, setting up simple indicators and reporting, identifying the links between processes and projects to gradually improve parts of these processes (e.g. 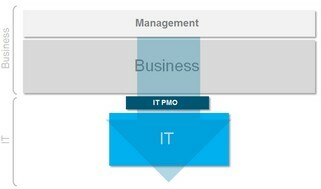 automation), aligning this with the IT architecture and portfolio of applications. This takes time, consistent systems, streamlined reporting, and above all — positive & involved people (aka corporate culture). There is no bottom line. It’s just that every now and then, in the history of management and corporate life, someone exclaims “our clients are most important!” And so the story repeats itself. Most likely, there are more facets of the cases mentioned above. Care to share a few?